A testament to the power of love and commitment and one of the best Americana releases of the year. One often hears that this or that film is a “couple’s movie,” but such distinction is rarely used to describe an album. 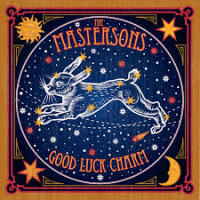 Not simply because Eleanor Whitmore and Chris Masterson are themselves a couple, but because of its ongoing theme of strength in commitment, the Mastersons’ Good Luck Charm might just be the best couple’s album of the year. It’s also an easy candidate to stand among the top Americana releases of 2014. Good Luck Charm is a roll the windows down and cruise off to some wonderful anywhere with your lover on a summer afternoon kind of album, which is just what Whitmore and Masterson sing about doing on "Easy By Your Side". It is an album of embraces, some unrequited, but most reciprocated with equal or intensified passion. Opening with an expression of anxiety that "It’s a long road and I don’t know where to go," the album progresses through a sequence of reflections on how the power of love and commitment overcome just about any challenge. It ends with the reassurance that "miles turn into memories" and that life is best lived when one embraces the moment. The complications of the big bad world do break through. Opening track “Good Luck Charm” is a state-of-our-union song, both the singers’ and our broader nation, that quickly demonstrates theirs to be the stronger of the two, their perseverance in the face of governmental evil and incompetence an act of personal political activism. The narrator of “Uniform” wonders how, after having played dutifully by the rules, he is left nonetheless with no choice but donning a uniform for a chance to get ahead. In “Closer to You”, Whitmore sings from the perspective of a daughter stumbling upon a letter from her long-deceased father. Reflecting on the missed opportunities for connection with this dutiful but emotionally distant man, she promises herself she’ll not make the same mistakes, mailing her own letter to a lover and asking "Will you join me on a journey for the rocky road / I promise you I’ll help you bear the heavy load." The songs on Good Luck Charm form a catalog of the fears and rewards of exposing one’s self to another. "If I Wanted To" gives voice to the stubborn individualist inside us all, and particularly that voice which speaks to contemporary women, warning them, rightly, against defining themselves according to their associations with men. "If I wanted to," they sing in unison, "Yeah, I could do it on my own." There’s no question of personal strength here, but sometimes being strong means being vulnerable and letting someone else into our heart, a sentiment repeated in "It’s Not Like Me". This song revels in a shock of awareness that one has become more whole through connection to another: "It’s not like me / To like somebody like you / Somebody who would fall into / The crazy arms of someone like me." The album’s centerpiece is the sublime duet "I Found You." The lessons of opening one’s self up to the possibilities of vulnerability are all learned here. "You might be the find of the century," Masterson sings, then, joined by Whitmore, evokes the album’s title again, “You could be my good luck charm." It may sound hokey, but I’m going to say it: anyone planning a wedding should give a listen to this song. I predict many a bride and groom will someday spin across the dance floor to Whitmore and Masterson’s shared chorus, “We believe in love / And we’ve learned a thing or two / It’s all or nothin’ now / That I found you." This is the Mastersons’ second release but the first to feature Whitmore and Masterson collaborating on all tracks. The band’s first album, Birds Fly South, collected songs the pair had written independently of each other. The amplified cohesiveness is evident not just in their shared vocals but in the album’s arrangements as well. Producer Jim Scott, best known for his work with Tom Petty and the Heartbreakers, brings a ringing clarity to these songs, several of which open with the power chord intensity so characteristic of the Heartbreakers’ sound. Scott’s production adds some growl to Whitmore’s guitar playing, while John Ginty’s keyboard playing evokes both Benmont Tench’s steady backing and the fills of Al Kooper’s work for Dylan. Drummer Mark Stepro demonstrates a knack for dropping a half step off beat to add emphasis to a companion’s instrumental or lyrical flourish. Whitmore’s and Masterson’s lilting voices are at the front of the mix. Both are strong singers, with Whitmore’s voice evoking Maria McKee or Susannah Hoffs while Masterson’s resides somewhere between Gary Louris and Gram Parsons. Good Luck Charm finds two independent singer-songwriters discovering the joy of collaboration, with a sympathetic band that amplifies the strength of their creative union. I wish them many happy years together. We all stand to benefit.